Only original once. Tucked away behind a house in rural, east Alabama, a rust-scabbed, first generation Pontiac Firebird soaks up the sunshine. Vent windows on the doors and lack of arrowhead marker lights on the quarter panels are a definite sign this is a 1967 model. 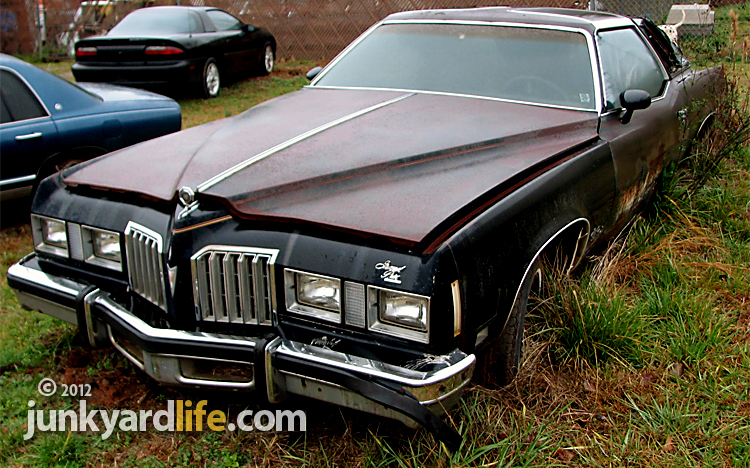 A quick scan of this Pontiac’s ramshackle shell reveals a silver arrowhead emblem on the front bumper. A clue that this Firebird was born to fly. Beneath the clutter atop this beaked ’Bird is an original, twin-scooped 400 hood. 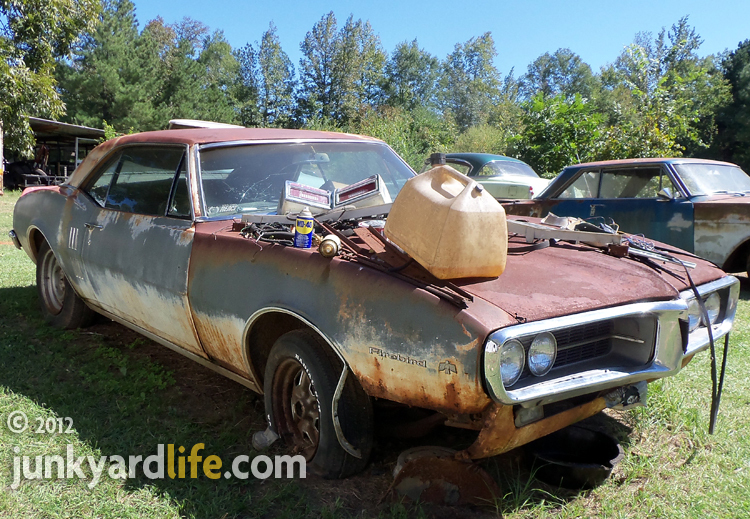 Finding an original first generation 1967 Firebird 400 is rare. All 1967-1969 Firebirds equipped with 400-V8s had the silver Pontiac arrowhead on their front bumper. These first-gen Firebirds were fast. They were smaller and lighter than the GTO but were offered with a wink-wink, “detuned” GTO engine. 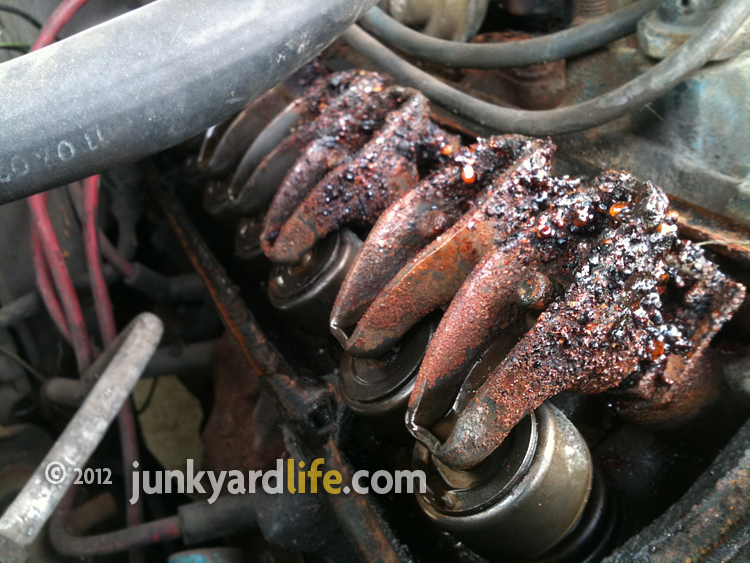 A quick adjustment of the carb and these F-bodies were hot to trot. We love to drive our Trans Ams. This ’67 Firebird was discovered on a recent, day-long cruise across east Alabama with my Firebird/Trans Am friends. Most of us have at least one second generation Firebird (1970-1981) model. We stopped in our tracks when we spotted a yard full of decaying hot rods. 1955 Chevys, 1969 Chevelles and a 1968 Corvette were in plain sight from the road. The homeowner was gracious enough to show us around his place and field a barrage of questions. Unfortunately, none of his cars were for sale. “The 1967 Firebird 400 is going to be restored by a relative someday,” he said. 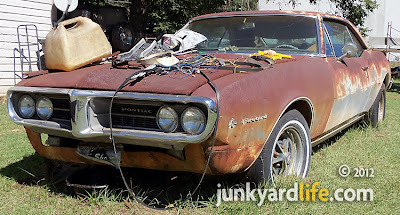 Under the junk on this 1967 Firebird is a 400 hood. Most of this man’s cars were parked outdoors, aged by the sun and rain and sporting the perfect patina of neglect that I embrace. Patina and rat rods are currently all the rage. But battered cars have long been a choice I’ve made out of necessity, because I deal with a non-existent hot rod budget and zero disposable income. Crusty cars are cheaper. Fact. Your junk, my treasure. 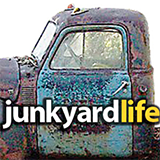 Know of a junkyard I need to visit or want to send me photos and info about a junkyard or cool car? Send emails to junkyardbull@gmail.com. White paint, primer, rust. And you thought they painted your car one color at the factory. The deck lid spoiler was not offered on the 1967 Firebird. Put those big 22-inch rims to work. 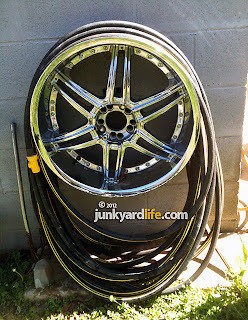 What to do with those embarrassing rims you thought were so cool in 2008? Tastes change and rims get bent. Chrome spinners no longer spin. You can no longer afford the 22-inch-tires or, worst of all, your too ashamed to ride around with “look-at-me, I spent more on my dub rims than my car.” You’ve got the big wheel blues? Instead of hauling them to the recycling yard, make a flashy water hose reel that will stand up to the elements. This discarded 22-inch, chrome wheel has new life as a hose reel. 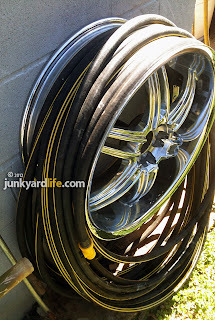 The rim’s wide width and low profile lip height allow the hose to slip off the wheel easily. That makes for quick work when you’ve got to hose off the shop floor. As a bonus, this wheel won’t become brittle and break like a weathered, plastic hose reel. Weld a sturdy bracket that you can make from pieces of flat, scrap steel. Be sure to measure the backspacing to get the proper fit on your wall. Weld two wheel studs, facing out from the wall it will mount to, onto the bracket. Bolt bracket to your shop’s wall then mount the giant rim using lug nuts onto the bracket. 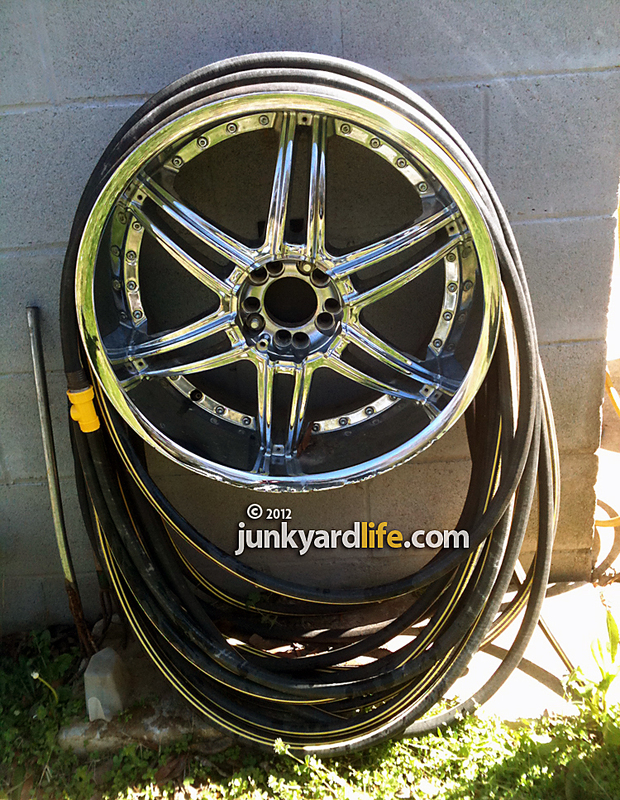 This rim had a universal bolt pattern with 10 lug holes, so lining up the two welded wheel studs was easy. 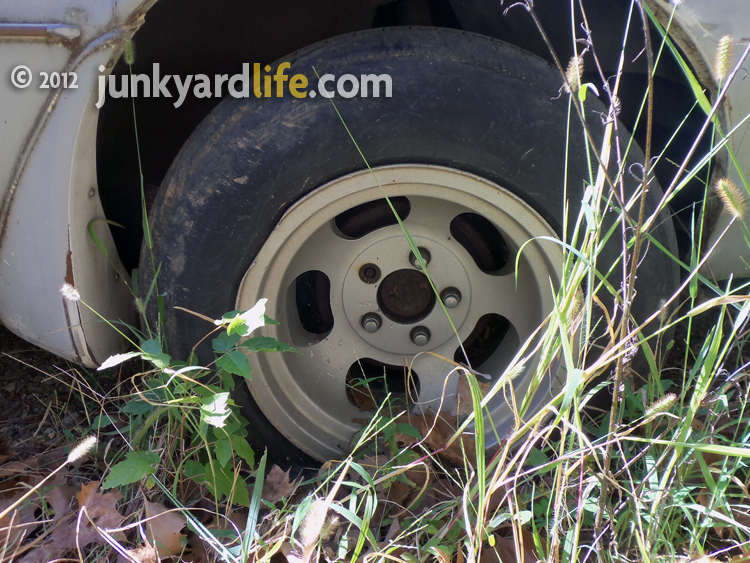 Depending on your neighborhood, you may want to use locking lug nuts. You could also build it to allow the rim to spin on a center hub as well. Plenty of room inside the wide wheel to park scrub brushes and soap. Save time and money doing things the junkyardlife way - on the cheap. You can’t afford to buy every tool or part that you need, so what can you do? You learn to make use of the things you have at your disposal and create an efficient wrenching area that saves money while your doing it. Where did the ’73-’77 colonnade cars go? In a recent Junkyard Life story, I was wondering aloud where all the Pontiac Grand Prix models from 1973-1977 were. Especially those of the SJ pedigree. Well, I found one! A recent road trip to South Carolina revealed this baby. I know, another ’77 model, it’s the least of my favorites from that generation of colonnade, but this one is an SJ package! 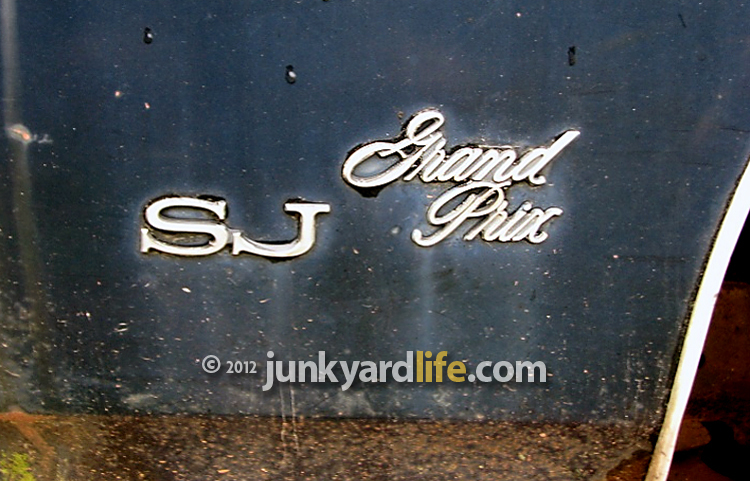 1977 SJ Grand Prix – something special. What a well optioned car it was, too. Some further Sherlocking uncovered a lot of features. Whomever ordered this car new must have emptied two ink pens checking off goodies to make this one expensive Grand Prix. Talk about sticker shock in 1977, it had power windows, power door locks, tilt wheel, cruise control, Rally gauges (minus the tachometer) hatch roof (t-tops) power bucket seats , deluxe lighting package and much more. It had four plain Jane GM wheels on it, indicating it may have worn hub caps at one time. I find that unlikely. I would venture a guess that it rolled out with Pontiac Rally II wheels or even the optional Snowflake wheel and some other car is rolling on them now. 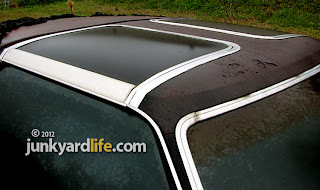 Before the term “T-Tops” was coined in the late 1970’s Pontiac referred to their new sporty roof option as a “Hatch Roof”. This super fun option was offered on the Grand Prix as well as a few other GM models. Pontiac started offering this roof on the Grand Prix in 1976. This Grand Prix was also a color that was hard to find in 1977, dark blue. I know it looks black in the photos (it was a rainy day) but it is in fact blue! The official Pontiac name was “Nautilus Blue.” You have to hand it to Pontiac for their colorful (get it? 'colorful') names for their paint choices. Code 29 changed names several times in the 1970s. Admirality Blue, Nocturne Blue, Midnight Blue and Gotta-gotta-gotta-the Blue just to name a few. I may have made that last one up, but the others are real. This dark blue Pontiac Grand Prix SJ model was trimmed with gold stripes. I bet it was stunning when it was new. The flat tires and weeds are just mocking us now! Notice the fancy side marker lights. Is this Pontiac 'Grand' enough? 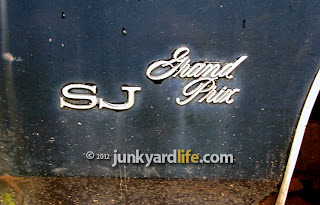 Roughly, one out of every five Grand Prixs were of the SJ variety in 1977. By the late 1970s it was easier to get a base model with not a lot of options and an appropriate sticker price. The top performance option in ’77 would have been the 400-V8 Pontiac engine. Sadly, the 'Grand' name was not so glamourous on all Grand Prixs. They were seemingly lost in a sea of several makes and models that had become comparable. But look! You could still have a decked out SJ model in 1977 – you just had to jump through more hoops to do it. You would think that since the original market for these cars was the sporty side of the affluent population that they would be better preserved than we seem to find them. In other words, it seems that we would find them vaulted and well preserved. But no! Something must have happened along the way. I know they are out there – so the search is still on. Happy Hunting! Mothers warn children to stay away from “bad” cars. You know, rusty ones with busted windshields and sharp protruding edges that can cut you quicker than the saw blade on a Swiss Army pocket knife. These cars have existed unloved, neglected and unmercifully abused. They are always bathed in an uneven coat of gray or black primer. Visually unmatched by a sinister reputation as “most likely driven by a convicted felon to his next crime.” Bystanders murmur cautiously in the unfortunate event that one of those “bad” cars parks next to them at the supermarket. Pulling their trembling children close as they anxiously approach a car known to all gear heads simply as a Junkyard Dog. Somewhere a mom can be overheard saying, “You will go to not heaven if you ever drive a car like that!” That’s exactly why I had to have this Junkyard Dog 1980 Pontiac Trans Am. It was love at first sight. This 1980 Pontiac Trans Am was in line for the car crusher. 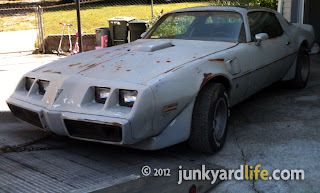 Late last year I spotted an abused late 1970s Trans Am wearing grey primer behind a chain link fence. It was in a sketchy neighborhood and the surrounding fence was topped by razor wire. The lot was used to store the “good” cars. The ones that the junk car buyer thought were worth saving instead of sending to the crusher. Several weeks later I saw a portable car crusher outside another storage lot owned by the same junk car buyer. He was clearing out his over stocked lot due to high scrap prices and lack of room. The same primered Trans Am was now parked in that lot! I had to act quick. 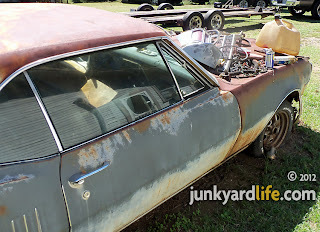 A hasty deal was made and I had the ratty, Junkyard Dog T/A delivered to my house for a $1,000. 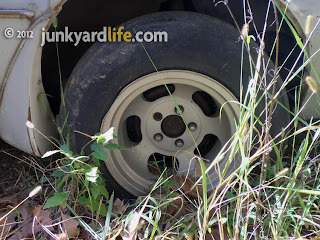 Vintage slot mags, 14-inch rims up front and fat 15-inch rims on the rear, ride on the hubs of the junkyard Dog Trans Am. I probably paid too much considering it was on the way to the car crusher but I let Firebird fever get the best of me. The junk car guy mentioned possibly selling it on ebay and he knew it was worth a grand. He baited me like a pro wheeler-dealer and I jumped on it. 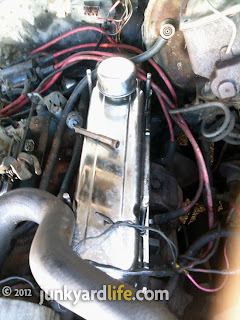 The T/A had a 1975 model 400 Pontiac engine (not correct for 1980 T/As), with 6X heads under the hood, chrome valve covers and a new looking fuel pump. Just enough eye candy to distract my brain from making a smart decision about the T/A's title. I received no paper work in the junk man’s deal, so it was left up to me to track down the previous owner who sold it to the junk car buyer in order to get a title. I wasn’t concerned until the car hit the ground at my house and I had no proof of ownership. Stupid. Stupid. Learn from my mistake. No title, no deal. Now it gets interesting. After a few dozen phone calls, because of an old lien against the vehicle, I tracked the Pontiac's former owner down. I made a surprise visit to the gentleman who was in his early 70s. I explained my situation and the previous owner got tears in his eyes. 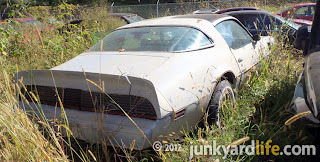 He regretted selling the car to the junk car man and wanted to buy back his Trans Am. But he could only pay me what the junk car guy paid him – $150. We talked about his days hot rodding the T/A and he decided to sign the Trans Am over to me. “Whew!” Now I could get the papers in order and get to work. That Camel Tan seat belt was part of the 1980 Trans Am's interior before it was used to secure the steering wheel by the junk car buyer. Save the cars worth saving. Crush the rest. It must be the mantra for people in the business of buying junk cars. They haul automotive eyesores away and give the former owner’s around $150. Easy money, for the junk car business. They can turn around and sell a 3,200 lb. car to a scrap metal recycler for around $400. The market price fluctuates but recently $12-to-$14 per 100 pounds is common. Moisture found its way into the long-dormant Pontiac 400 engine, making a mess of the rocker arms. 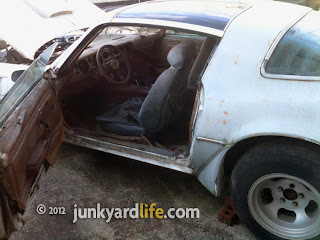 Before you get all fired up and decide to haul all the old cars out of junkyards to save them from neglect or worse, a date with the car crusher, consider the value of the car as a whole and the sum of its parts. Is it worth it? Are you willing to pay up and do the work required to drive a junkyard dog? So many cars, so little time. 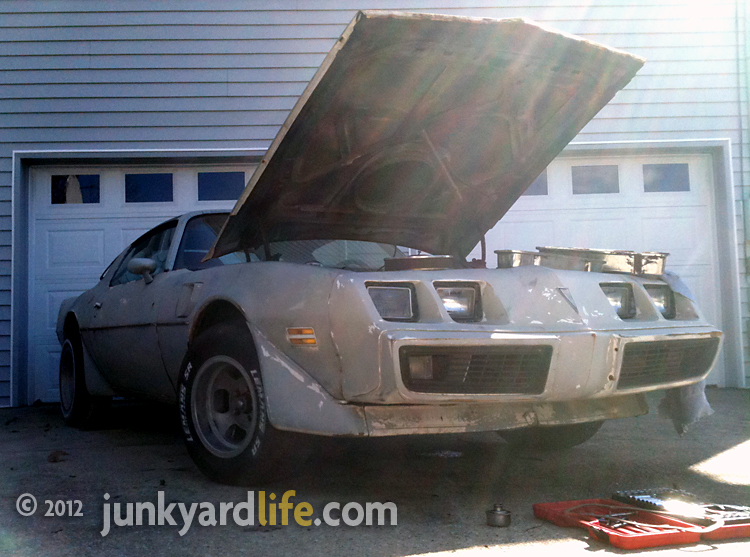 Do I want to keep the Junkyard Dog Trans Am or sell it to a new owner pining for a Second Gen Trans Am? I’ve got the JYD T/A in my driveway, now it’s time to put up or shut up. Can I get this mean machine back on the road? Stay tuned. Junkyard Dog T/A does have chrome valve covers to hide the rusty valvetrain. 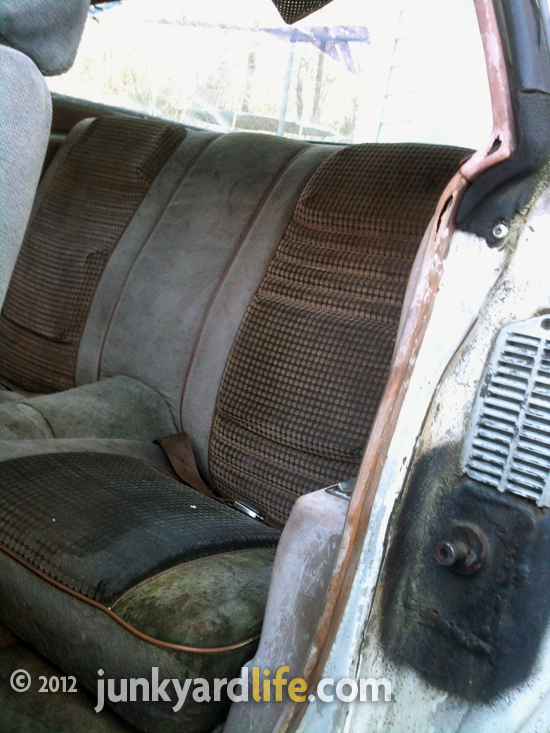 Leaky T-tops and Camel Tan Hobnail cloth rear seats. 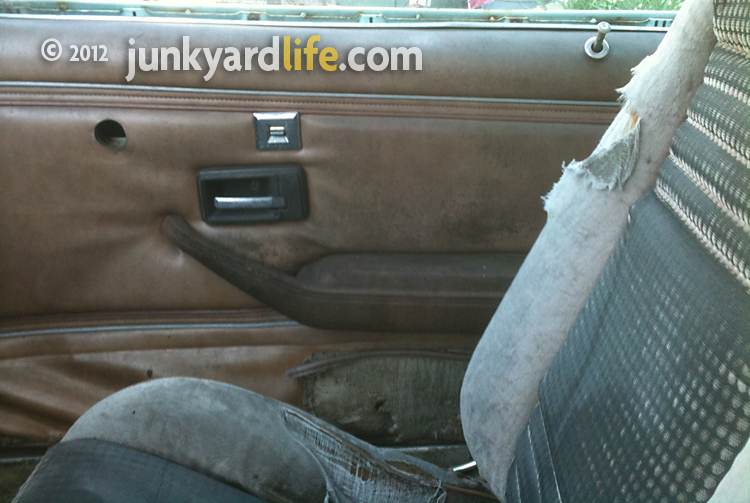 This is the Junkyard Dog T/A’s good door panel. Power locks! 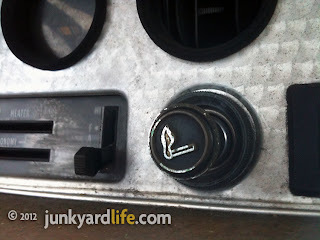 JYD Trans Am's flashy second-gen cigarette lighter has been heavily used but still remains in place. Unloading the Trans Am without damaging the front spoiler... too late. It already had a split in the center. 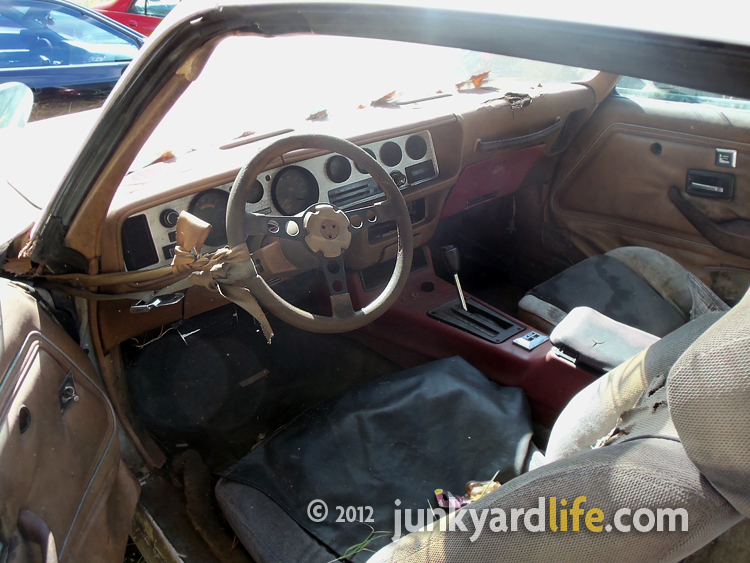 In true Junkyard Dog form, the ’80 Trans Am has a driver's seat from another car. Check out the shaker hood scoop. It's riveted to the hood. Not the first time I’ve had one like this.